Thousands of Tunisians rioted in their capital city Tuesday over an art exhibition they claimed posed an “insult” to Islam. Thousands of Tunisians rioted in their capital city Tuesday over an art exhibition they claimed posed an “insult” to Islam. The exhibition, which took place in an upscale neighborhood of a Tunis suburb, included a work that spelled out the name of G-d by using insects. The demonstrators were members of the Salafi Muslim sect, an extremist form of Islam – part of the same group that welcomed Gaza's de facto Hamas Prime Minister Ismail Haniyeh on a visit to their city earlier in the year. Just last month, thousands of Salafi Muslims, many of whom were dressed in Afghan military uniforms and were waving Salafist black flags, marched on Kairouan in central Tunisia, chanting, “We are all the children of Osama (bin Laden) and “Jews, Jews, the army of Mohammed is back.” The exclusively male march was organized as part of the extremist Islamic movement’s annual assembly, AFP reported. Approximately 1,000 Jews still remain in the country. 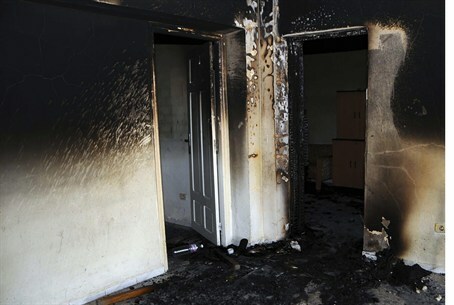 Demonstrators hurled rocks and firebombs (Molotov cocktails) at a courthouse and police stations as well as at the offices of secular political parties in Tunis, and in other cities around the country as well. According to the Tunisian Interior Ministry, 65 security officers were wounded trying to stem the violence, and 162 arrests were made. Police immediately imposed a curfew after sunset in the capital and seven other areas. The violence threatened the country's budding democracy, albeit one led by a moderate Islamic government. Tunisians were split by some of the fiercest internecine clashes since the country's Jasmine Revolution, the January 2011 uprising that brought down the longtime government of President Zine el-Abidine Ben Ali. The Tunisian revolution was credited with igniting the so-called “Arab Spring” uprisings that continue to exert an impact on the region. The wave of revolutions that swept Arab nations throughout the Middle East changed nearly every government, and has continued to have an impact on the region. The decades-long regimes of Egypt, Libya and Yemen were also toppled, with Syria's President Bashar al-Assad the latest to be threatened.